How quickly a week passes. Thanks to everyone for their comments and links, and thanks again to Josh for having me. Back to New York for you. I thought I should leave you with some links to help you keep abreast of our capitol food scene. In addition to the aforementioned Tom Sietsema chats, there are his reviews and of course the esteemed Washington Post Food Section. The Washington City Paper has a new restaurant critic, Todd Kliman, and his columns make for great reading. Online we have the DC & Delmarva forum on eGullet, and the Washington DC & Baltimore Message Board on Chowhound. Have a great summer, and have fun wearing white. There are those who say DC is a Southern town, those who say DC is a Northern town tucked into the South, and there's John F. Kennedy, who said DC offered only the best of Southern efficiency and Northern hospitality. I say DC is a territory with no representation for all its taxation. But chefs around here spare not with the Southern food. Surprisingly, Georgia Brown's is one of our only restaurants that advertises itself as a Southern eatery. But it's hardly the only spot serving spoonbread, collard greens, Black Forest ham, fried catfish and fancy versions of coleslaw. My old boss Susan McCreight Lindeborg serves some of the city's finest hushpuppies at The Majestic Café. And who doesn't serve some version of shrimp and cheese grits? I wish I liked cheese grits, because they are so ubiquitous. I like plain grits. I know to get those at the Florida Avenue Grill, any morning but Sunday when they are closed. But cheese grits taste like a lot of melted cheese with too much pepper and salt, with the grainy texture of gooey hominy. I wish shrimp and grits faded in favor of more fried chicken. Until then, I'll happily make it at home: Bell & Evans soaked in buttermilk, crisped up in Crisco. No cheese. DC is abuzz with talk of Eric Ziebold's imminent arrival at the new Mandarin Hotel here in Southwest DC. (OK, not to mention the excitement over the Mandarin itself). Ziebold started his culinary career in Washington at Vidalia Restaurant. He was most recently Thomas Keller's chef de cuisine at The French Laundry. Ziebold's arrival will probably be the biggest chef import since Michel Richard closed Citrus in LA to run Georgetown's Citronelle. But it's even better than that. For a while now, DC has been enjoying an extraordinary increase in the number of fantastic restaurants, both in town and in our lovely Edge Cities. Two other talented transplants to the area (from NYC), Frank Morales at Zola and John Krinn at 2941, both say they came to DC from New York because DC was such an untapped market. Morales said DC is like the Wild West, the field is so wide open. And evidence shows he is right. The Washington Post's hard-working restaurant critic, Tom Sietsema, conducts an online chat every Wednesday at 11 AM. Many folks around here find it addictive reading. Some of the complaining contributors can get a little shrill, but it's always lively. Where the buffalo roam ... and the deer and the antelope play ... well, DC has the first two. The antelopes don't roam so much as hang out at the National Zoo, but today I have just seen roaming bison with my own eyes, not two hours from the nation's capital. Cibola Farms in Culpeper, VA raise grass-fed, very free ranging bison, rabbits, chickens and goats. The goats graze a little too far back from the road to admire them, but the buffalo are right up front. The self-touring guidelines warn you that bison are wild and not to be trusted; all the same, I got to stand pretty close to a mother bison with her baby calf, and they looked very mellow. But apparently a low-stress lifestyle is an important part of the Cibola Farms process. I'll get to try the results soon: I took home a couple of ribeyes for the holiday weekend. I'm over the moon. "Home on the Range" was a favorite lullaby when I was little, and I suppose I always did want such a home. And now I have one. One would hope Washingtonians were engaged in heated debates about the future of our government, and of course they are, but at the moment it's a little hard to hear because of the billions of cicadas that have emerged in the last few weeks to find mates and reproduce and burrow for another 17 years before coming out again. They're called Brood X, and the news -- not to mention the sidewalks and trees -- are full of them. The originals are also upon us: softshell season runs from April to October or thereabouts. Much as I love them, hardshells I'm taking to even more this year, steamed with a good crust of Old Bay and served with corn on the cob and coleslaw. I had my first dozen a couple of weeks ago at the Bethesda Crab House, which gets my vote for best Eastern-shore-style crab eatery inside the beltway. The sweet taste of Old Bay and seawater on the fingers marks the official start to summer. Welcome to Washington, everyone, and thanks to Josh Friedland for sending y'all down here. It's a beautiful place, and I'm honored to show you around a little. 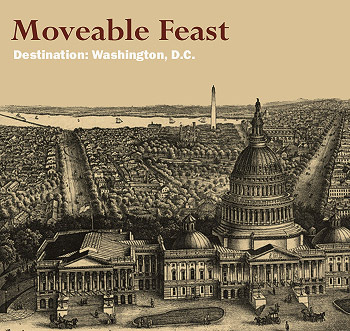 The Food Section travels to Washington, DC, this week for the inaugural edition of Moveable Feast, a new feature consisting of local food writing with a decidedly non-New York focus. District of Columbia-born and based food writer Emily Kaiser has graciously agreed to guest-edit and provide a week’s worth of on-the-ground reports on all things gastronomical in the nation’s capital. A former chef, Ms. Kaiser brings the perspective of the professional kitchen to her writing. One of her most recent articles, appearing in the New York Times, was on chefs who buck conventional culinary wisdom about how and when to use salt in cooking and “salt early if not often.” More of her articles can be found on her Web site. While Ms. Kaiser takes the helm, Appetizers will continue to be updated daily. However, Agenda, the weekly listing of food events in New York City, will be on a one week hiatus, returning on June 2. The fourth installment of Is My Blog Burning?, initiated by Chez Pim, takes "Around the World in a Bowl of Rice" as its theme. Previous installments of the international online cooking event have focused on soup, tartines, and cake. Each edition of Is My Blog Burning? has come to represent a challenge to make something new and, possibly, inventive. My first thought was to make arancini ("little oranges"), the Italian balls of rice that are stuffed with cheese and fried. I have never made them and always wanted to, but then visions of horchata flashed into my mind. Mexican Horchata is a drink made from rice and (as I learned through this experience) almonds. 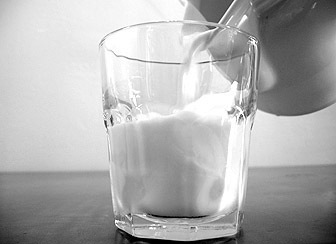 It has the consistency and appearance of milk, but it is absolutely dairy-free. The thirst-quenching drink is commonplace in Mexican restaurants and taquerias in California, where I grew up, yet I rarely see the drink in New York City. I never thought about making it at home, but now I had the opportunity. Searching for recipes online, I came across a variety of different methods. One recipe, from chef Zarela Martinez, involved boiling and simmering the rice and then letting it soak. Other approaches involved soaking whole grains of rice without any cooking at all. Yet another recipe suggested grinding the rice first before soaking. This technique, common to a number of the recipes I found, was the one I finally ended up using. There were also a number of variations in flavoring the horchata. While some called for lime, others suggested adding vanilla. The idea of adding vanilla to the milk-like concoction sounded too good to pass up. I ended up using a recipe by Gale Gand, with a few of my own modifications (less water, more sugar, and real vanilla bean). Grind the rice into a fine powder (a coffee grinder works perfectly). Remove the skins of the almonds by blanching them in boiling water: Drop the almonds in boiling water, scoop them out after about 30 seconds, and after they have cooled, the almonds should squirt right out of their skins when pressed between thumb and forefinger. 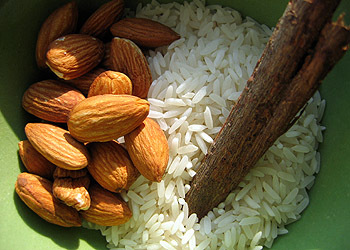 Combine the ground rice, blanched almonds, cinnamon, and the seeds that have been scraped out of one vanilla bean, with 3 1/2 cups of water and let sit overnight, covered. The next day, pour the mixture into a blender and puree until smooth, adding the sugar and an additional 2 1/2 cups of water. Strain the Horchata using a strainer and cheesecloth. There will be a lot of solids. Press them against the cheesecloth-lined strainer to get out all of the liquid, but don't stop there. Pick up the cheesecloth to form a pouch and squeeze out every last drop with your hands. The final step is to add additional water to thin out the drink. The original recipe called for 2 cups, but I added only one. I liked the concentrated flavor, and I didn't want it to be too diluted. BEFORE AND AFTER Rice, almonds, and cinnamon (above) combine with vanilla and sugar to make refreshing horchata (below). We paid the teenage girl three dollars for the audio tour, slipped the little listening devices around our necks, and we were off to explore the place. 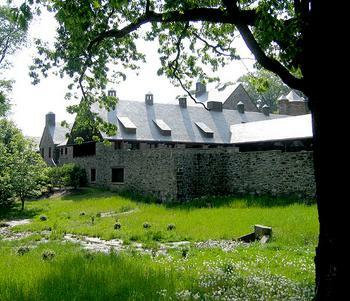 This familiar scene could have played out at the Met or any other traditional museum, but instead we were about to tour the Stone Barns Center for Food and Agriculture, a sort of living museum and monument to sustainable food production.